This year’s Veterans Day program at the Government Printing Office features a speaker who served in the U.S. Army from 1947 to 1951, including 9 months on the front line in Korea. He’s a member of the Buffalo Soldiers organization, which preserves the memory of the six all African-American Army units formed after the Civil War for service in the American West. Their service, also commemorated at the Buffalo Soldiers National Museum, is a proud chapter in American history but also a reminder of the days when the armed forces were segregated by race. Integration of the Armed Forces, 1940-1965 tells the story of how this not so creditable period in our history was brought to an end. This definitive administrative history provides a capsule history of African-Americans in the armed forces and how both the professed war aims of the U.S. and civil rights activists combined to bring this issue to the fore. Interestingly, the book also points out that the post-war attempt to maintain segregated military units through the use of quotas while expanding the pool of African-American servicemen by conscription caused even very traditional military men to reassess the need for integration for the sake of military efficiency, if nothing else. After President Truman’s 1948 Executive Order 9981, calling on the armed forces to provide equal treatment and opportunity for black servicemen, the barriers began to fall, although other issues, particularly housing, made the process of integration extend well into the 1960’s. Even civilian employees in the defense establishment endured the pains of segregation and the slow evolutionary path of its demise. The Invisible Cryptologists: African-Americans, WW II to 1956 is a sort of microhistory of one small Government agency’s journey from racial injustice. World War II saw what was then the Signals Intelligence Service (SIS) hire African-Americans, up until then employed mainly as messengers, to decipher commercial telegraph codes that might contain valuable information emanating from companies Tokyo, Berlin, and other international locations. After the war, the machine section (or “the plantation,” one of its numerous unflattering nicknames) used African Americans to transfer Russian intercepts from radio tapes to punch cards – a tedious job in hot and dirty conditions without any realistic possibility of promotion up and out. Yes, it was a discreditable period, but these books show that our Government and our country, when confronted with injustice, were able to change. They’re both worth reading. You can find Integration of the Armed Forces here or buy a copy here. 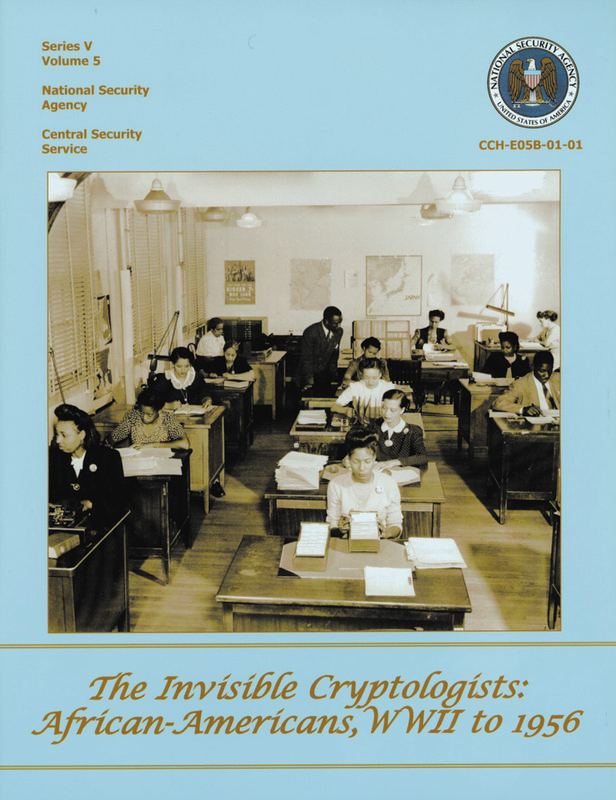 You can read The Invisible Cryptologists here or order a free copy here. This entry was posted on Wednesday, November 10th, 2010 at 9:15 am and is filed under National Security Agency, U.S. Army. You can follow any responses to this entry through the RSS 2.0 feed. You can leave a response, or trackback from your own site. Alas, thinking articles are not always appreciated. Glad you enjoyed this one! IF YOU WANT TO HAVE A STRONG ARMY FORCED , YOU MUST FIND SOLUTIONS , FOR EVERY PROBLEM!THE MOST DIFFICULT PROBLEM IN U.S. ARMY WAS THE RACIAL INJUSTICE!IT IS GOOD THAT THIS MAIN PROBLEM WAS SOLVED FOR MANY DECADES!ONE THE OTHER HAND , TODAY , THERE ARE ARMY FORCES LIKE GREEK ARMY , WHERE A DIFERENT KIND OF PROBLEM (ABOUT FASISTIC SERVICEMEN), WILL NEVER BE SOLVED!